Baby Boomers take a lot into consideration when searching for the ideal location to retire as this might be their last home purchase according to Real Estate Scorecard. They understand the importance of maintaining a healthy and fulfilling lifestyle to promote longevity to enjoy the wide variety of resources found within a well-designed master planned community. “Aging in place” is what most folks want over age 65; to live a normal life in their own residence as they grow older. And a plus would be a place that when healthcare issues arise, a caring, likeminded neighbor is not far away. Proactive communities like Big Canoe in northern Georgia have found a number of ways to alleviate these concerns as they cater to retirees and young families alike. Big Canoe is an award winning mountain community spread across seven mountains about an hour or so outside the city of Atlanta. Among the 8,000 acres of preserved natural topography are three sparkling fresh water lakes and a variety of health and wellness amenities that includes over 22 miles of easy hiking trails. This caring mountain community took the initiative to create a supportive environment to address many of the concerns associated with their aging residents. 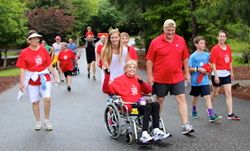 Spearheaded in 2013 by the Big Canoe Home Owners Association (HOA), the Strategic Planning Committee was formed with a mission to “help residents remain in their homes in Big Canoe while dealing with temporary healthcare situations." As a result of their hard work and efforts, the Big Canoe Wellness Collaborate was formed in April of 2014 to create and oversee non-emergency and non-medical wellness services for its residents in need. The vision has become a reality and the program is becoming a role model for communities in the US. There is no charge to the residents for these services. It provides an assured peace of mind in knowing folks live in a place where “neighbors help neighbors”. Intake and referral services are offered through (BC Info) which help alleviate stress and promotes a sense of caring amongst residents. (BC Rides) offers free transportation to doctor’s appointments. They also will pick-up grocery orders from IGA when needed. Meal preparation and delivery are offered by volunteers during illness through (BC Meals). Companionship is key during “down times” and provides a warm expression of caring from the much appreciated (BC Visits) volunteers. After an exhausting medical procedure or stressful doctor visit, the Wheels and Meals program offers a one-time delicious meal prepared by resident volunteers. Medical information kits are free and are helpful for healthcare providers during an emergency, the forms contain pertinent medical and personal information. The free kits are available throughout the community thanks to the Big Canoe Public Safety and Wellness Collaborative. The program has been an overwhelming success with over 120 trained volunteers and more than 320 services extended since inception. In 2016, the Wellness Collaborative added a fundraising arm that helped raise money at the highly successful “Taste of the Mountains” event to help override the costs of rehab equipment for the Fitness Center, printing, insurance and software to track the program’s objectives. In addition to the services offered, the proactive Healthy Living Committee was created to motivate and encourage Boomers to engage in the healthy lifestyle offered living at Big Canoe in the mountains of Atlanta Georgia. Walking groups of varying levels, adding wellness stations to the hiking trails and healthy meal preparation are the focus for 2018. Activity is a way of life every single day at Big Canoe and is considered one of the keys to “aging in place." Maybe it’s a match of tennis, round of golf, fitness class or a brisk hike through the mountains to get the metabolism fired up, the choices abound for wellness at Big Canoe. The 17,000-square foot Fitness Center offers cardio and strength machines, personal training, an indoor lap pool, 2 indoor and 8 outdoor tennis/pickleball courts, racket ball and squash courts, a sauna, hot tub and spa services. Tennis is equally popular here and with over 300 active players, Big Canoe was honored with the Bliss Award as the 2017 “Best Tennis Community of the Year” by Real Estate Scorecard. There are 10 courts to choose from, 8 lighted tennis courts outdoors and 4 designated specifically for Pickleball play. An on-site pro shop offers a wide selection of apparel and gear and the courts have ample seating for spectators. Both private and group lessons are offered daily by USPTA certified professionals. Clinics, leagues and fun community events are also held year-round. For avid golfers, the 27-hole championship mountain course is an adventure that residents can enjoy daily and they can mix it play as the course is three distinct 9 hole courses; Choctaw, Cherokee, and Creek; and a driving range and practice greens to challenge players of all levels. The impressive greenway designed by Joe Lee incorporates the majestic mountainous terrain and lush natural landscaping for a memorable and stimulating round of golf. Water lovers are at home at Big Canoe. Lake Petit is massive covering 111 acres and is one of 3 lakes found on the property. Stocked with rainbow trout this is indeed fisherman’s paradise. Water sports are popular as well whether it be canoeing, kayaking or paddle boarding. Big Canoe Marina offers fishing gear and boat rentals. Living here is like living on vacation everyday and continues to persuade folks to ditch “big city living”, to find their own prized Big Canoe real estate. With easy access to major highways, folks are discovering that living a stress-free and safe life is possible at Big Canoe. There are four attractive neighborhoods to choose from and each home is distinctively designed according to the stringent standards and superb craftsmanship of master builders. New homes at Big Canoe start in the $300k’s and resales are available in the $200k’s. Home sites can be found from the $50k’s and provide a great opportunity to build exactly what folks want in this highly acclaimed mountain oasis. Neighbors here have proven how much they care about each other and enjoy a highly active social calendar. There are over 50 clubs to join at Big Canoe. One group, the Ridgerunners has over 400 female members who engage in fun events throughout the year. There are numerous annual festivals, summer camps for kids, fishing tournaments, golf and tennis competitions and enriching classes held monthly to keep folks active and engaged. With the wonderful success of the efforts and volunteers of the Big Canoe Wellness Collaborative, this community is well prepared in addressing health concerns that may arise during retirement years. Boomers looking to relocate to one of the most affordable mountain towns, are encouraged to spend time at Big Canoe. Their Discovery Package is a great way to learn more. Call Big Canoe directly at 866.244.2266 to schedule a visit.